No one deserves to be treated like this. Let's help Jamal so if this ever happens again, he'll be ready! Watch original video here. UPDATE: After hitting our initial goal, we've updated the fundraising target so we can provide as much help as possible! Any surpluses that are not used to cover the travel expenses to bring Jamal, his sister, and their parents to California will be donated directly to the family so that they can afford to continue training jiu-jitsu when they return home to the UK! Jamal is a 15-year old Syrian Refugee who lives in the UK with his family. 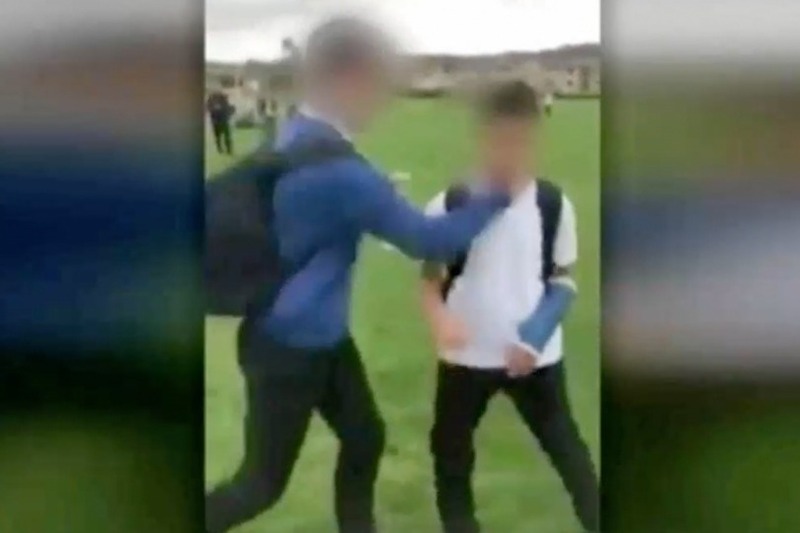 On October 25, he was violently attacked on the playground at Almondbury Community School in the UK. The incident was captured on video and is making headlines all over the world. Jamal has not returned to school since the incident, and when interviewed by ITV he said: "I feel unsafe everywhere I go, even to the shop. I woke up at night and just started crying." Our names are Ryron and Rener Gracie. We are self-defense instructors in a family that is credited with creating Brazilian Jiu-jitsu. Even though we have never met Jamal, we have helped many children overcome the overwhelming challenges he is currently facing, and we know we can do the same for him. We will be donating our time to train Jamal. 100% of the funds generated will be spent on covering the travel expenses. If there is any surplus it will be donated to Jamal's family. We are reaching out to the family's attorney, Tasnime Akunjee, to confirm that 1) they will accept our offer if the funds are raised, and 2) that they can legally travel to the U.S. when the time comes. Our family has been empowering the weak to defend against the strong for nearly 100 years, and we can provide everything Jamal needs to feel safe again. The negative effects of this type of harassment has the power to shape the rest of his life. Regardless of the amount, we appreciate any donation you can make to help make this opportunity possible for Jamal. Understandably, Jamal may have some reservations about learning something new, especially on the other side of the world. For those of you who have jiu-jitsu experience, please leave an encouraging comment along with your donation, so Jamal knows he has nothing to worry about and that this is the perfect step to take in regaining control of his life. 1) Who you are and where you’re from? Ryron and Rener Gracie from California. 2) Your relationship with the parties for whom you are raising funds and your method of contact with them. We have no relationship with the beneficiaries, but we have the unique ability to help them overcome the challenges they're facing which is why we started this campaign. Our method of contact is through their attorney. 3) How the funds will be spent (be specific as possible)? Airfare, hotel, car, food, and all other travel expenses. If we can, we're going to get the entire family tickets to Disneyland as well. 4) Your specific plan for how the funds will be withdrawn from and sent to the beneficiary of the campaign. We will withdraw the funds and handle the booking of their travel and all other logistics. Any surplus funds at the end of the trip will be donated to the family with hopes that they continue their jiu-jitsu training in the UK. Hey guys, we’ve been in communication with the attorney and he says the family has declined the opportunity to come to California for the all-expenses -paid training opportunity. We offered for us to fly to the UK to train them in their house, and they also declined. We tried everything, but unfortunately, it’s not happening. Thank you for believing in jiu-jitsu, and in us, but this time we couldn’t get it done. All your donations will be fully refunded by GoFundMe in the next week or so. Hey guys, Jamal’s little sister has also endured months of bullying and was captured on video getting thrown to the ground. One report said that she even attempted to take her own life. Thanks to all of you guys, we’re going to book her a seat on the same flight as Jamal, and and we’re going to provide her the same life-changing training opportunity. Both kids have dropped out of school and we have no time to lose. This family is in trouble, but with your help and the magic of jiu-jitsu we’re gonna help them get back on track! WE DID IT! In less than 24 hours we hit our initial fundraising goal! In order to provide as much assistance as possible to Jamal's family, we have increased the funding target. Any surplus funds that are not used to cover the travel expenses to bring Jamal and his family to California will be donated directly to the family so that they can afford to continue training jiu-jitsu when they return home to the UK!